Oh goody, here’s another amazing Alice in Wonderland themed party that will surely brighten our day and this time it was wonderfully done by the artistic ladies of Pinwheel Crafts & Events. A theme that opens our imagination to endless ideas and possibilities, the word “exaggerate” is very much welcome in this theme. For Elize’s tea party though, they chose to veer away from the usual colorfest and over the top setup associated with this theme. Whimsical with lots of girly flair pretty much sums up this gorgeous celebration. I know Elize’s mom, Nathalie, way back in time. Knowing Nathalie, something soft and pretty is definitely her style. Seeing the color scheme and cutesy knickknacks used around the venue, Pinwheel Crafts & Events earned Nathalie’s seal of approval (and mine, too!). Elize’s darling 3D invites look adorable. Care for a cup of tea at Elize’s wonderland? Yes please! From the entrance down to the hanging pages at the ceiling, everything looks dainty and sweet. On the side note: Hello there, Stan! There’s the uber talented Stanley Ong in action making a cameo appearance. These huge playing cards used at the stage backdrop provided a clean and fresh look to this often extravagantly styled theme. For the centerpiece, different elements in reference to the book were used such as clocks, playing cards, tea cups and hat while these fresh flowers gave it a more sophisticated look. Various activities kept Elize’s guest preoccupied throughout the party. Aside from the different glam booths, there’s the “decorate your own” hat and cup activity booth and photo-op area. A staple in every tea party…sweets! Elize’s cake and cupcakes look so cute and very much into the theme as well. Here’s Elize and her brother all dressed to impress in designer Christine Lam’s signature children couture creation. Foodcart: c/o Bash & Coordinates (taho, pork bbq, nyfd, and sugarlick ice cream). thanks for sharing our invitation. Joyleen, I still have mine 🙂 Cute! hi.. that’s one of the cutest invitation we had made. Love them too. 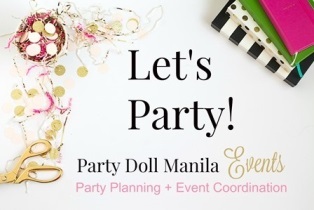 I always find themed birthday party too amazing and wonderful as they have great ways to give to their guests…this theme is one remarkable indeed. Awww Tea Party is a royal kind of celebration! Tea party for a little princess is sure a great event for her and her guests. The ceiling decors look really nice. Do you know the exact location? And can I have the venue’s contact number? Thanks! :”) Marina East Clubhouse is one of my choices for my son’s birthday. Hi Ms. Jo anne, do you know someone that can sponsor to have this venue rented?